Living a Fit and Full Life: Encourage STEM Learning with Educational Insight's Nancy B’s Science Club® Microscope and MoonScope! + Giveaway! 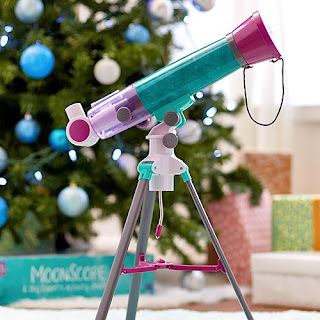 Encourage STEM Learning with Educational Insight's Nancy B’s Science Club® Microscope and MoonScope! + Giveaway! Zoom in on the fun with the Nancy B Microscope! This 2-in-1 light and dissecting microscope gives up-close views 30x, 100x, and 400x magnifications of anything you can imagine, from peacock feathers and goldfish scales to your own skin and cheek cells. The included keepsake journal features 22 pages of fun science experiments for kids and activities from observation to creative writing, drawing, and more. 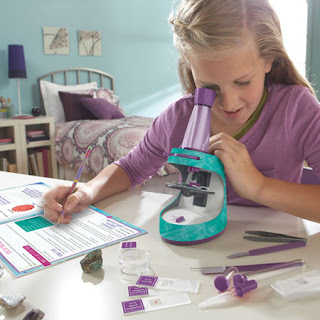 Educational Insight's Nancy B’s Science Club® Microscope and Activity Journal is an absolutely wonderful product for kids! 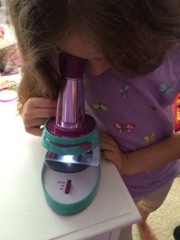 As a homeschooling mom I've been on the hunt for the perfect microscope for my daughter for some time now. 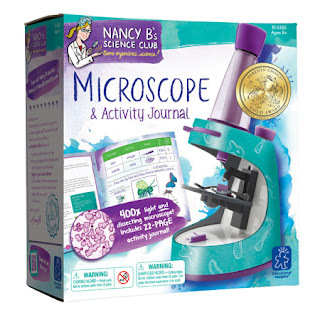 My daughter absolutely loves nature and learning about new things so I knew Nancy B’s Science Club® Microscope and Activity Journal would be something she'd really enjoy. I'm blown away by the quality of Nancy B’s Science Club® Microscope! I've seen many microscopes on my hunt for the perfect one and none of them even compare to this one. I love that it has a light both on top and on bottom. It works perfectly and does 30x, 100x, and 400x magnifications which is perfect for viewing even the tiniest of things. I also love that it comes with a few sample slides so you can begin using the microscope right away. You can also use the blank slides to create your own slides which is my daughters favorite thing to do. My daughter enjoys finding new things to view and is extremely excited to use her Activity Journal to document all her findings. 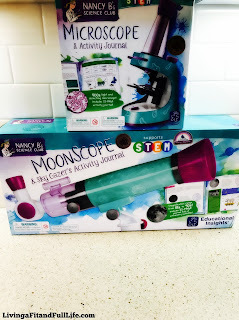 Nancy B's Science Club MoonScope & Activity Journal is another amazing product for kids! I absolutely love that it gets kids excited about astronomy as it's definitely one of my favorite things to learn about. I also love that it comes with a Sky Gazer’s Journal that is packed with fun activities, like learning about the lunar phases, writing a moon myth, drawing your own man in the moon, and more! It's the perfect way to encourage kids to get excited about astronomy! Click HERE to learn more about Educational Insight! Follow Educational Insight on social media!